Arts-based research was born in an academic context where the arts and research unite. The departing point of today’s art-based educational research studies is to bring a more in-depth and critical thought. As a growing field of interest, art-based research is becoming an effective approach in every step of the research practice. The relationship between art-based research and practice provides a fertile ground for new and extraordinary approaches to the research phenomenon. That’s why in liberal arts and educational research, literature on theoretical and practical dimensions of art-based research becomes essential. Such literature directs its concentration toward introducing artists and social scientists to various approaches of art-based research while making it possible, for them, to apply these approaches and reach original results. These approaches give chance to the researcher to arrange the research process, participants, and other elements of the researched phenomenon in different ways utilizing different angles. In other words, especially in educational contexts, art-based research approaches bring new possibilities for detailed and deep interpretation with new points of view and a new understanding of the nature of research. In this respect, art-based educational research has emerged as a rising field of study that provides new space for effective interaction and communication among researchers, education professionals, and artists. The researcher conducting art-based research approaches has to utilize relationships between multiple disciplines creating new ways of seeing. Badmington, N. (ed) (2000) Posthumanism. Basingstoke: Palgrave. Barone, T. & Eisner, E. W. (1997) Art-based educational research. R. M. Jaeger, (Ed. ), Complementary methods for research in education içinde, (ss., 73-116).Washington DC. : American Educational Research Association Press. Barone, T. (2008). How arts-based research can change minds. M. Cahnmann-Taylor & R. Siegesmund (Eds. ), Arts-based research in education: Foundations for practice içinde (ss. 28-49). New York: Routledge. Boudreau, M., Gefen, D. & Straub, D. (2001). Validation in is research: A state-of-the-art assessment, MIS Quarterly, (25) 1, 1-23. Chalmers I, Altman D.G., (1995). Systematic reviews. London: BMJ Publishing Group. Cahnmann-Taylor, M., & Siegesmund, R. (Eds.) (2008). Arts-based research in education: Foundations for practice. New York, NY: Routledge. Clark A and Percy-Smith B (2006). Beyond consultation: Participatory practices in everyday spaces, Children, Youth and Environments, 16 (2), 1-9. Cobb, P., Confrey, J., diSessa, A., Lehrer, R. and Schauble, L. (2003). Design experiments in educational research. Educational Researcher, 32(1), 9–13. Cole, A. L. & Knowles, J. G. (2001). Lives in context: The Art of life history research. Walnut Creek, CA: Alta Mira Press. Collins, A., Joseph, D. and Bielaczyc, K. (2004). Design research: Theoretical and methodological issues. Journal of the Learning Sciences, 13(1), 15–42. Cooper H. (1998). Synthesizing research: A guide for literature reviews. Thousand Oaks: Sage Publications. Creswell, J. W., Plano Clark, V. L., Gutmann, M. L. and Hanson, W. E. (2003). Advanced mixed methods research designs. A.Tashakkori ve C. Teddlie (Ed. ), Handbook of mixed methods in social and behavioral research içinde (s. 209–240). Thousand Oaks, CA: Sage. Denzin N.K. & Lincoln, Y. S.(2005). The Sage handbook of qualitative research. Thousand Oaks, CA: Sage Publications. Diamond, C. T. P. & Mullen, C. A. (Eds. ), (1999). The postmodern educator: Arts-based inquiries and teacher development. Newyork: Peter Lang. Dixon, M. & Senior, K. (2010). Traversing theory and transgressing academic discourses: Arts-based research in teacher education, International Journal of Education and the Arts. 10(24). Eisner, E. W. (1997). The promise and perils of alternative forms of data representation. Educational Researcher, 22(7), 5-11. Eisner, E. W. & Barone, T. (1997). Art-based educational research. R. M. Jaeger (Ed. 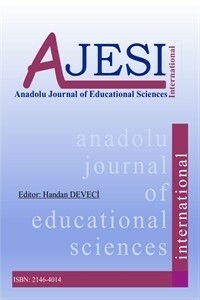 ), Complementary methods for research in education içinde (ss. 73-79). AERA. Washington, DC. Finley, S. & Knowles, J. G., (1995). Researcher as artist/ artist as researcher. Qualitative Inquiry, 1(1), 110-142. Finley, S. (2005). Arts-based inquiry: Performing revolutionary pedagogy. N. K. Denzin, & Y. S. Lincoln (Eds.). The Sage Handbook of Qualitative Research içinde (ss. 681-694).. Thousand Oaks, CA: Sage Publications. Fraenkel, J., Wallen, N., & Hyun, H.H. (2012). How to design and evaluate research in education (8. basım). Boston: McGraw Hill. Hickman, R. (2007). Visual art as a vehicle for educational research. International Journal of Art & Design Education, 26(3), 314-324. Irwin, R. L. (2004). A/r/tography: A metonymic métissage. In Irwin, R. L. & de Cosson, A. (Eds.). A/r/tography: Rendering self through arts based living inquiry içinde (ss. 27-38). Vancouver, BC: Pacific Educational Press. Irwin, R. L. & O Donoghue, D. (2012). Encountering pedagogy through relational art practices. International Journal of Art and Design Education, 31(3), 221-236. Muller, M.J. (2008). Participatory design: The third space in HCI. J. Jacko and A. Sears (Ed.) içinde, Human-computer interaction: Development process. Mahway, NJ, Erlbaum. Onwuegbuzie, A. J., and Combs, J. P. (2010). Emergent data analysis techniques in mixed methods research: a synthesis. Abbas Tashakkori and Charles Teddlie (Ed. ), Handbook of mixed methods in social and behavioral research (2. Baskı) içinde (s. 397-430). Thousand Oaks, CA: Sage. Skivenes, M. & Stranbu, A. (2006). A child perspective and children’s participation, children, Youth and Environments, 16(2), p. 10-27. Smith, Susan E. (1997). Participatory action-research within the global context. Susan Smith, Dennis B. Willms and Nancy A. Johnson (eds.) içinde (s. 1-6). Nurtured by Knowledge; Learning to do Participatory Action-Research. New York: Apex Press. Sullivan, G. (2010). Art practice as research: Inquiry in visual arts (2nd ed.). Thousand Oaks CA: Sage. Wang, F. and Hannafin, M.J. (2005). Design-based research and technology-enhanced learning environments. Educational Technology Research and Development, 53(4), 5-23. Zaphiris, P. & Constantinou, P. (2007). Using participatory design in the development of a language learning tool. Interactive Technology and Smart Education, 4(2), 79-90.